THE TRUTH: SCIENTISTS AGREE THERE IS NO APOCALYPSE HAPPENING. Scientists agree according to the IPCC that the world is about to end if climate change is not stopped (wonder if that means when the climate changes from summer to winter). Nevertheless, when it comes to bees being wiped out in the USA due to pesticides (Roundup in particular) and GMOs, we are told not to believe reports that this is the case. Even if Scientists do not know why the bees are being killed, the news from Genetic Literacy Project is Roundup and GMOs are not killing the bees. The bees are not facing their own apocalypse, so it is just bad luck for the beekeepers. SCIENTISTS AGREE THERE IS NO APOCALYPSE HAPPENING. Scientists agree according to the IPCC that the world is about to end if climate change is not stopped (wonder if that means when the climate changes from summer to winter). Nevertheless, when it comes to bees being wiped out in the USA due to pesticides (Roundup in particular) and GMOs, we are told not to believe reports that this is the case. Even if Scientists do not know why the bees are being killed, the news from Genetic Literacy Project is Roundup and GMOs are not killing the bees. The bees are not facing their own apocalypse, so it is just bad luck for the beekeepers. Genetic Literacy Project provides this report. Crisis shift? Bees may not be facing apocalypse but what about beekeepers? Beekeeping tends to be more on the commercial side. Scientists are now in agreement that we are not facing a beepocalypse as many in the media environmental activists and journalists have been predicting. Bee populations aren’t declining; they’re rising. According to statistics kept by the U.S. Department of Agriculture and the Food and Agriculture Organization of the United Nations, honeybee populations in the United States, Canada and Europe have been stable or growing for the two decades. “Beekeepers are indeed “working nearly twice as hard as ever,” as Tucker has said. Beekeepers report having to split their hives more often to make up for losses, entailing more work than in previous decades. And for commercial beekeepers maintaining thousands of bee hives, all of this additional work means more employees, more salaries, and more expenses. The major driver of these challenges is the near-global spread of parasites like the varroa mite and the dozens of other diseases that beset commercial honey bees, which require a great deal more work and expense for both commercial and hobbyist beekeepers. Varroa mite counts must be carefully monitored, and mite control preparations applied at precisely the right times. Otherwise, mite infestations can get ahead of beekeepers, propagate and devastate the hives. But the hard work and increased challenges of beekeeping today don’t necessarily translate into economic calamity — especially for the more sophisticated beekeepers who have modernized their operations and kept abreast of changing conditions. The U.S. Department of Agriculture’s economic statistics bear this out. Demand for honey has almost doubled over the past quarter century to 468.3 million pounds by 2013. Per capita honey consumption in the U.S. is up nearly 50 percent over the same period. When demand is high, prices go up. The retail price of honey has risen more than 50 percent in the last decade, (about the same as beeswax), with total revenue from honey production reaching $2.835 billion in 2012. Commercial beekeepers have also prospered from a parallel boom in the market for almonds, which is critically dependent on bees for pollination. In fact, as much as 75 percent of all U.S. commercial beehives are committed to almond growing, the bees trucked into California in the first quarter of each year to pollinate the to 870,000 acres of almond groves (which have more than doubled in size since the mid-1980s). 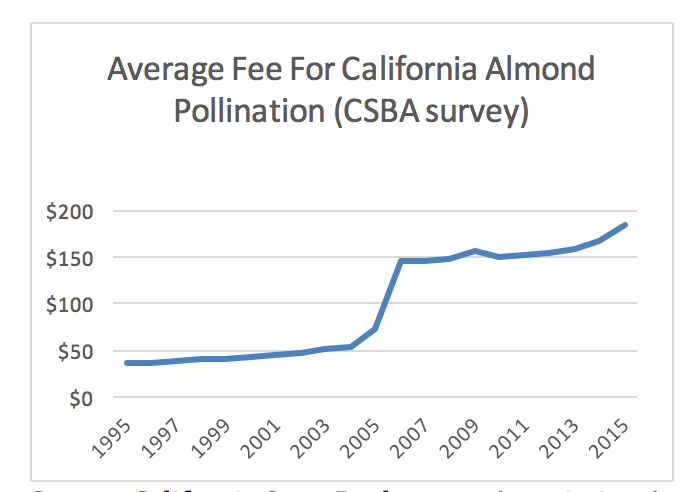 With rising pollination services demand, hive rental fees for almond pollination have risen to record levels, with prices up a staggering 428% (or about $150 extra per colony) since the 1990s. 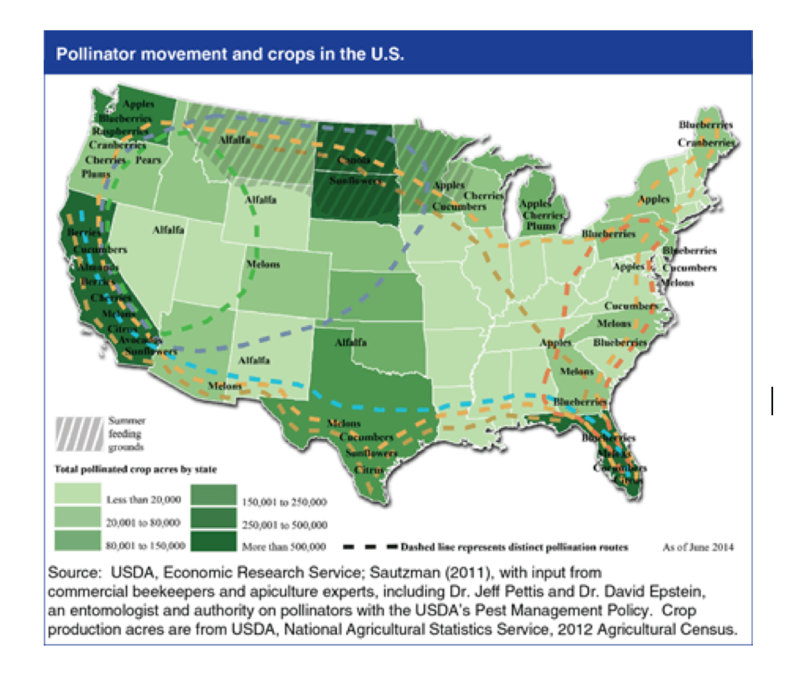 Together with other pollinated crops, including sunflowers, canola, grapes, apples, cherries, watermelons, and blueberries, total revenue for pollination services added up to $655.6 million in 2012, the most recently available data. While the cross-continent pollination treks made by beekeepers are highly profitable, the huge stresses imposed on the bees themselves helps explain the less than optimum health of many commercial bee colonies. 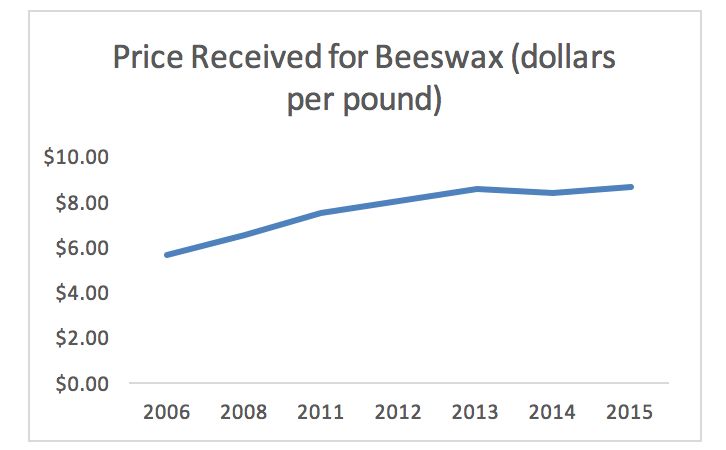 One result is that despite the fact that we now have more bee coloniesthan we have had in 20 years, the volume of U.S. honey production and the per-colony honey yield — as opposed to the price per pound of honey — has been on a general decline. United States honey production in 2013 is about 35 percent lower than in 1989. The downward trend in U.S. honey production means that U.S. beekeepers now satisfy less than 1/3 of total U.S. honey demand. The difference is made up from imports from other nations – chiefly Argentina, Vietnam, India, Brazil, Canada, Uruguay, Mexico, Ukraine, Turkey and Taiwan. 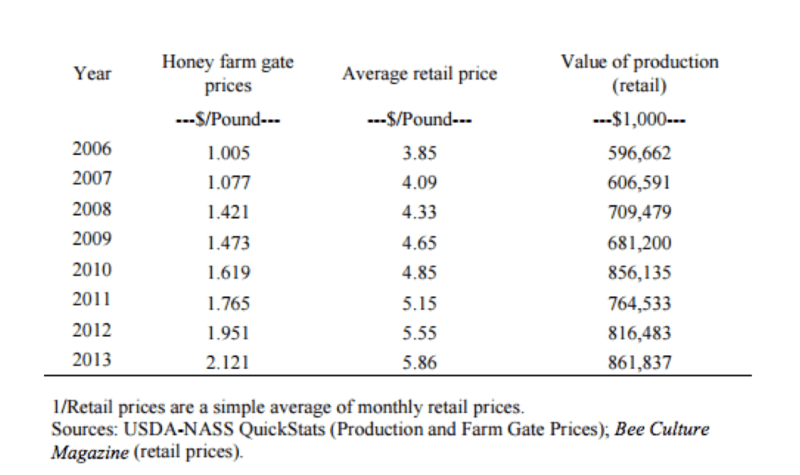 Despite all this foreign competition, however, high U.S. demand has continued to exert upward pressure on U.S. honey prices, which have more than doubled to $2.12 per pound since the Colony Collapse Disorder crisis of 2006. Jon Entine, executive director of the Genetic Literacy Project, is a Senior Fellow at the World Food Center Institute for Food and Agricultural Literacy, University of California-Davis.